The future has finally arrived with home automation. Science fiction, and even popular cartoons, showed the potential of automation many years before the “Internet of Things” was a real possibility. Now you can finally take control of your house just like you’ve seen in space-age fictions with home automation technologies available from NYCONN Security Systems, Inc.
Home automation is a broad term that refers to a set of technologies and devices that are used to automate various utilities and services within a house. While the earliest examples of automating labor at home might include “old-fashioned technology” like washing machines, dishwashers and refrigerators, the popularity of the Internet and modern electronics has made it possible to connect new labor-saving devices in innovative ways, even allowing for remote access to these home devices and services. Imagine being able to adjust the heat or air conditioning at home while you are at work. Imagine being able to deactivate the security system and unlock the door while at the office if your child arrives home from school and forgot their house key. Think about the possibilities when you can close the drapes, dim the lights, adjust the temperature and start a movie all with the touch of a button on your phone. 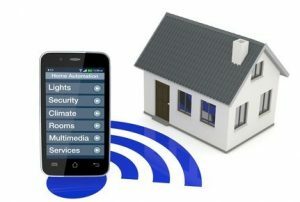 Home automation makes it possible to link together climate control, entertainment systems, the security system, lighting and more – and to monitor or control it all from any Internet-connected device, like a smartphone or computer. At NYCONN Security Systems, we can help you take control of your home in new and exciting ways that can allow you to automate routine tasks, monitor the safety and comfort of your home from anywhere, and stay in control even while away from home. We stay on top of the latest trends and technologies, and can help you implement them at your home. To learn even more about home automation devices and services, call us today at 914-241-3700 or 860-354-1947 and find out how we can bring the future to your home today.